More hair than a Whitesnake reunion. Anyone need a toupee? We were about an hour into our float—that “we” being me, my dad, and rising musky star Chris Willen of Superior Outfitters—when the first fish materialized. The way it gradually appeared, it’s shadowy umber just a few shades darker than the tannin-stained water, made me think the river itself had magically coalesced into an evil darkness skulking slowly behind my fly. Quickening my strip, I was overwhelmed by the wildness of the moment–not in the “Hey, isn’t this crazy and awesome!” sense, but in the “I’m in the house of a natural predator with bad intentions” way. My fly—and, by extension, me—was being hunted by a mean customer, a bad seed, a creature with a long history of violence. I ran out of water, unfortunately, and figure-eighting didn’t bring him back. But it’s that first musky, even though we moved a few other, bigger fish that day, that haunts me. And looking back I realized that what I saw in the musky–the river coming alive–was not only figuratively, but literally, true: the Musky is what America’s Northwoods rivers funnel all of their life and energy into–north country microfauna feeding the nymphs that feed suckers and smallmouth that feed the Toothy Emperor, the King of the North. It’s a fish–and a way of fishing–that has fast become my obsession of the year. Here’s some of what I learned from tapping into Chris’s fishy brain that day. Something special from Wisconsin. 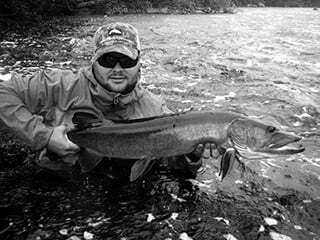 Chris grunts under the weight of a healthy river musky. Musky are big, hungry, and efficient. They eat big prey, which means you’ve got to throw big flies. “You couldn’t tie them too big if you tried,” Chris explains. “There are guys in these parts that use 30-inch northern for bait on a quick-strike rig. 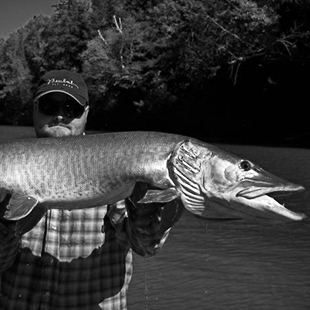 No joke.” Musky are also lateral-line feeders, so those big flies must push water. A lot of water. The end result? You’re pulling against tension all day long. It might start out feeling like stripping a streamer, but as the day wears on, it’s going to feel more like pulling a boot. Know what you’re getting yourself into. 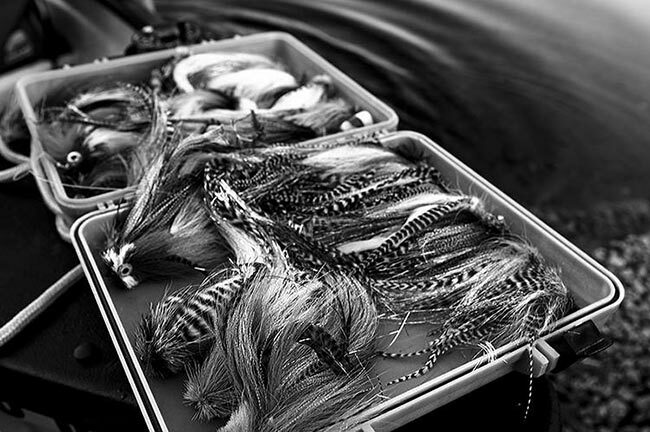 And have a game plan–and back-up gameplan–for the stripping fingers of your rod hand. That kind of heavy, all-day pressure not only cuts into flesh and other materials, it burns it. There you have it. A big game primer for one of the biggest and baddest games out there. If you’ve been curious about the King of the North, now’s the time to throw your hat into the ring. For the next few months, these toothy rulers have nothing to do but eat their subjects. Good luck getting bit.